Some of them believe french-polishing is the only acceptable finish on concert guitars, others defend many synthetic like polyurethane, nitro liqueur, polyester etc. My personal preference is polyurethane, but I also give the option of french-polishing on top only. – Very thin finish, does not change or reduce wood vibration. – Limited protection. As a hygroscopic material, suffers color and texture changes for the contact with skin. 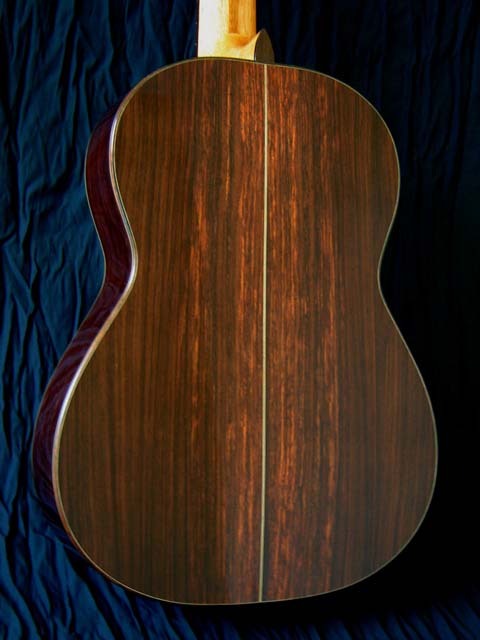 – A thick coat reduces and distorces wood vibration, bringing great prejudice to the instrument sound. – Great protection. It’s impermeable. With minimum care has enormous durability. I believe that application is more important then the used material. Many guitar factories use polyurethane – and others – with the only purpose of finding a beautiful finish. For that they apply many coats of the product. This is the case of a too thick finish. For musical instruments, what I do is sanding after each aply, until I remove totally the finish from the wood surface. There is material left only in the pores of the wood. When all the porosity is filled, I apply one only thin coat, ad polish it a few days later. This is the technique I use in my guitars – high gloss or opaque. And, as I said before, I have the french-polish option, on top only.